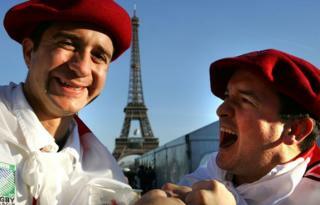 Franglais row: Is the English language conquering France? The French parliament is debating a new road map for French universities, which includes the proposal of allowing courses to be taught in English. For some, this amounts to a betrayal of the national language and, more specifically, of a particular way at looking at the world - for others it's just accepting the inevitable. It all started with a faux-pas - to use a French phrase commonly borrowed by English-speakers. On 20 March, when French higher education minister Genevieve Fioraso unveiled the proposed road map, she mentioned that there were only 3,000 Indian students in France. In order to attract more foreign students, she added, French universities would have to start offering courses taught in English. "We must teach in English or there will only remain in France a handful of experts discussing Proust around the table," she said. But Proust was an unfortunate choice. The author is actually one of France's best literary exports and the reason why many students in the world take up French at university. The influential Academie Francaise, the official authority on the French language founded in 1635, led a chorus of disapproval of Fioraso's proposals. Few countries guard their linguistic heritage as jealously as France, and defend it so vigorously from foreign threats - such as the growing worldwide influence of English. Though, interestingly, the institution was originally founded by Cardinal Richelieu to fight off the invasion of Italian in the French language. Today, there are as many Italian as there are English originated words in the French language. But Fioraso fought back, saying she only meant to be pragmatic. Elite French business schools, and Grandes Ecoles such as the Institute of Political Studies also known as Sciences-Po, have been teaching in English for the last 15 years. Why, she asks, shouldn't other less prestigious universities follow suit? According to the left-leaning daily newspaper Liberation, 790 higher education courses in France are already taught in English, and like Fioraso it sees nothing wrong with the idea. Its all-English front page on Tuesday featured the words "Let's do it" in bold capital letters. Liberation represents a growing fringe of the French population - young, urban, trendy, the kind which, in the last 20 years, has adopted franglais in their daily life. For them, the work of the Academie Francaise - which offers grammatical advice and alternatives to new foreign words - now feels irrelevant and obsolete. They like nothing more than adding English sounding suffixes to French words, or combining English words into new terms such as "fooding" (made out of "food" and "feeling"). The result is a fantasy English that exists nowhere else; this, many think in France, is an inverted snobbery. "Why speak French well when you can speak English badly?" asks with irony the literary critic Bernard Pivot. These people present themselves as pure pragmatists. English is conquering the world, they say, and it would be foolish to resist an inevitable evolution. Once the language of the world's elite, French now ranks as only the eighth most-spoken language in the world and its influence is clearly receding. Even within Europe, if one takes a look at the European Union, there is no doubt that since the addition of 10 new member states in 2004 French has lost its appeal. Once the lingua franca around the negotiating tables in Brussels and Strasbourg, French has given way to English. Though, if the UK were to leave the EU, there would be no reason for this to continue - English would remain the joint official language only of Malta, as well as widely-spoken in the Republic of Ireland (where Irish is the "national language") and Cyprus. Those who oppose the introduction of English in French universities are attached not only to the national language, however, but more importantly, to the vision of the world it carries. A vision that differs from the English or American world view. This is the crux of the matter, and, for a majority in France, the strongest argument in favour of rejecting the government's bill. Teaching English is very different, they argue, from teaching in English. They support the teaching of foreign languages, and suggest starting it even earlier - in nursery schools - but they oppose the teaching of subjects such as mathematics, history and literature in any language but French. Antoine Compagnon, a distinguished French scholar who taught at Columbia University and is a member of the American Academy of Arts and Science, maintained in a public letter that it would be better to teach foreign students French than tolerate "Globish" (the primitive English of non-English-speakers) and the dumbing down of teaching that would inevitably follow. Foreign students who choose France over Britain, Compagnon says, are not only choosing the French lifestyle but also its culture and language. Teaching them Proust in English, in France, would be a travesty. French MP Pouria Amirshahi, who represents French expats in North and West Africa, backed him up. "The signal given out to those everywhere who learn French abroad and in francophone countries throughout the world is not reassuring," told The Daily Telegraph. It looks as though, in France, if you want to teach students in English, you have to do it quietly like the elite universities which never asked permission but never boasted about it either. Here is a selection of readers' Franglais favourites.